There is always a way round everything when it comes to painting. The reason I say this, is because some art students were looking at one of my paintings and I was explaining that initially there was a village underneath. The village didn’t work out and looked pretty strange as for some reason I used orange! However, it didn’t concern me. 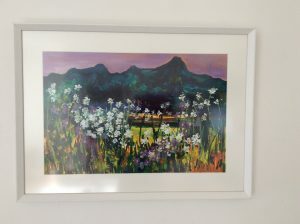 I simply covered it with this and with that and this image of fresh mountain wild flowers emerged as I came up with a new way of using a palette knife I’d never used before. Sometimes I may have a particular effect I wish to bring about, but the final destination may not be reached the way I think it will. I have to let go so that not only the paints flow, but I do too maybe coming up with something I’d never have thought of in a million years. This keeps painting fresh and exciting.